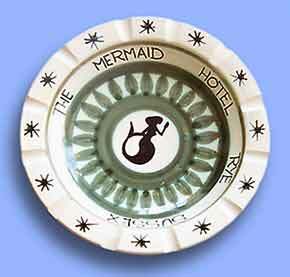 David Sharp Mermaid dish - 8½" (215 mm) diameter. The Mermaid was David's 'local'. David Sharp was born in 1932 in Hackney, East London. The product of a broken home, he was taken in charge of the church and when he was eight was sent to foster parents in Sutton Valence, Kent. They were caring parents, who noticed his talent for art and decided that he should go to art school when his conventional education was finished. Duly he enrolled in a two-year foundation course at Maidstone School of Art. During a summer holiday he visited the charming little town of Rye, just over the Kent border in Sussex. He saw the Rye Pottery and his interest in ceramics was born. In 1947 he became Rye Pottery's first apprentice. He worked for them for six years, learning the necessary skills for a potter, before being called up to serve his country in the army. During his National Service his talents as a boxer and as a musician came to the fore. When he returned to the pottery two things had changed - the pottery and him. Rye Pottery had grown and become more commercial, concentrating less on studio pottery and more on commercial runs, and David had seen a lot more of the world. He had itchy feet and in 1956 left to form Rye Art Pottery, which later became Cinque Port Pottery, (note singular 'Port'), with his friend George Gray. When the partnership dissolved, David stayed at the existing Cinque Ports Pottery (which had now become plural) premises at The Mint. David's new company was named the David Sharp Pottery. The David Sharp Pottery started in 1964 producing studio pottery. In 1965 he was joined by his wife, Dot, and towards the end of the sixties the pottery began to flourish. During this time he started making animal figures and his famous wall plaques. In the seventies the production of the house plaques had grown to the extent that he needed to take on a full-time painter, Joyce Stewart, and form a separate company, the Rye Plaque Company. The plaques became a familiar feature of Rye, and are still produced and shipped world wide today. Sharp seemed never able to stand still; he was always game for a new venture, and in 1973 he teamed up with Michael Doulton, with funding from the Doulton family, to make table wares. The enterprise was not successful. In the winter of that year the oil crisis struck and Britain was plunged into the turmoil of the three-day-week. Businesses were allowed to operate on only three days of each week, to conserve energy, and at any time power cuts were likely to occur - the use of electric kilns was made impossible. The venture folded and Michael Doulton went to Australia. Sharp's animals, by this time, were well known and in 1974 he was commissioned by Bayer, the chemical company, to make a sheep for them to give to their farmer customers. This commission was repeated annually for some years with the type of animal changing each time. In the late seventies he was asked to make a fisherman toby jug for the Royal National Lifeboat Institution. When it was made, they didn't want it, so he kept it for himself and it became the first of a series of half-a-dozen Buccaneers of Britain. The buccaneers were modelled on drinking companions, and most were to be seen in the flesh walking around Rye. They were not a great commercial success, being large and ugly - not right for the time, but now very collectable. The slump in the property market in the early nineties caused a drop in sales of house plaques. David went back to making more individual studio pottery using a gas kiln that produced better glazes than the electric kilns. He produced some fine work during this period until his death in 1993. The pottery is run now by Dot and Ben Sharp, and can still be found at The Mint, Rye. The showroom has a changing display of studio pottery and house plaques and you can visit the David Sharp Pottery web site.